With all the features built into this oven, it was difficult to find any negative qualities with it. Without question, Cuisinart has the end user in mind with the easy to clean nonstick interior and auto-out rack. While the limitations of the maximum temperature setting of 450 degrees does present a challenge with a few foods that require higher temperatures, this negative can be cast to the side in favor of all the other positive features. Meal preparation can now be done without the fears of not cooking the food evenly. For those of us who love a rotisserie meal, this oven has everything you need to prepare and enjoy. 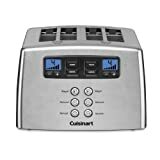 For the single individual, couples, and smaller families this Cuisinart TOB-200 Rotisserie Convection Toaster Oven will complement your busy lifestyle and provide you with years of dependable use. The hours can be long and frustrating in the kitchen preparing meals. We have hours wrapped up in all that a meal entails; from the grocery store to the meal prep and then the actual cooking. The frustration that sets in when we have labored long hours for the perfect meal come to the surface when the food comes out unevenly cooked. Looking for a versatile countertop oven that can evenly roast your poultry and meat rotisserie style, bake, reheat, broil, and prepare a pizza? 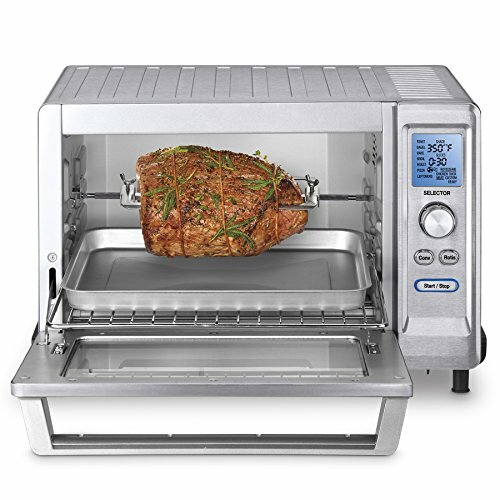 Look no further than the Cuisinart TOB-200 Rotisserie Convection Toaster Oven. It is one of the best convection ovens under $200 on the market. Let’s take an unbiased look at this countertop oven. You will not find a sales pitch here; this is an honest review of the positive and negative features and benefits of this model. It is best to know, from the beginning, what you are considering to purchase rather than getting it home only to be disappointed in some of the potential drawbacks. At the end a comprehensive review will summarize our findings. Then, you can decide for yourself whether this oven meets and or potentially exceeds your needs and wants for your use for years to come. 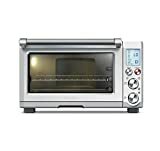 With a 0.75 cubic-foot capacity, this oven can conveniently bake a 12-inch pizza, toast 6 slices of bread, and roast a 4 pound chicken or pot roast. Available space is a critical element in what countertop oven to choose from. How many of us have stood in the aisle of a local retailer and wondered to ourselves whether certain items will fit in the countertop oven we are looking at? Now you know what this Cuisinart TOB-200 model can hold. How many of us have had to guess at the proper heat setting and time with a microwave oven? All of us. Take the guesswork out with this model, as you enjoy the precise 4 quartz heating elements and heat sensor technology. With 12 cooking function options, including rotisserie and toasting settings, your meals will be evenly prepared. Cleaning an oven used to be a hassle. Not if you decide to go with this oven. With its nonstick interior design, cleaning will become a hassle free experience. You can cast away your struggles with manual timers as this features digital controls. Have you ever burned your hands or wrists when pulling something out of an oven? A needless experience as this oven features an auto-out oven rack enabling you to get your prepared hot food out easily. Right out of the box you can begin to enjoy this countertop convection oven. Cuisinart wants to ensure that you have all that you need to get started immediately. Accessories that are included consist of; baking and drip pan, oven rack, spit and skewers for rotisserie, broil rack, skewer grip, and a recipe booklet. If you are single or a couple with a small family this oven is ideal based upon its capacity. The stainless steel appearance blends well in virtually all kitchens. The ease of use and simplicity of cleaning makes this unit perfect for the busy professionals and couples. A larger household may find this unit to be too small. 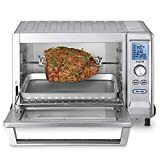 If you or your family does not enjoy a rotisserie meal, you will probably want to consider another countertop oven that does not feature the rotisserie option.